Lisa led me down the hall and pushed open the huge, thick door. It swung open like it was protecting the mad scientist’s lab (or NORAD). Stepping inside, I discovered that it wasn’t too far off. The room had but one window, and that looked in on The Machine. Echoing off the walls was a mechanical ticking, grinding, pinging. Lisa told me to empty my pockets, take out my earrings, and secure them in the locker. Then she led me through the door into the room with The Machine. 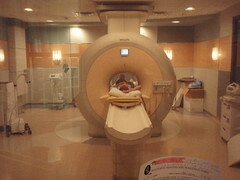 This was my first experience with Magnetic Resonance Imaging. Lisa had my lie down on the table, and she put a pillow under my knees. She secured my head between the headrest, which would prevent it from moving. To add insult to (literal) injury, she added a mask-like device just above my face, that was supposed to help her (or The Machine?) 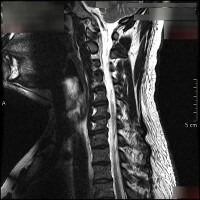 isolate the cervical spine. We talked a little about the diameter of the tube that she was preparing to stick me into – it was a little smaller than I had anticipated. I told her I thought I would be okay, and let’s give it a try. After I inserted the earplugs, she pressed some buttons and the table raised up, then I slowly was inserted headfirst (and backwards) into the giant machine. As I slid backwards, there was a tugging at the top of my pants. I quickly realized that the magnet was trying to grab my belt buckle. The Machine was eager to get me inside it’s grip. There were no lights on inside the machine, and although it wasn’t dark per se, it was rather ominous. I lay there for a few seconds before deciding that I might not make it the 15 minutes that Lisa told me I would be in for. I asked to be removed. Knowing now what to expect, I took a few deep breaths, and tried to focus on how my body was reacting to the situation it was in. Lisa gave me a “panic switch” to press if I needed, I gave her the nod, and I went back into The Machine. This time focusing on my breathing, and with my eyes closed. The thoughts started almost as soon as the table bucked to a stop. The first one, and the one that kept trying to come back over and over was “What if I freak out? My first reaction will be to try to sit up. I will hit my head on the tube, and will not be able to get out. I will lie back down, even more freaked out and the cycle will repeat.” I acknowledged the thought, let it pass, and focused again on my breathing. Other thoughts tried to insert themselves. As The Machine went through it’s cycles I tried to be mindful of what I was sensing, rather than the thoughts that were coming quickly. In the second to last test, The Machine was making a series of pulse-like mechanical noises, and I started to really listen to them. It was interesting to hear how the sound would start, stretch, and end. With a little bit of concentration, I was able to slow down each “note”, and really listen. After I was slid out, I sat up and welcomed the seemingly endless space of the small room I was in like it was an old friend. I stumbled out of the room, grabbed my things and escaped into the fullness of the outside world. ...to really know someone, you have to look inside.